What’s Up With the Arizona Housing Market? 2011 has seen quite an increase in buyer activity across the state. Let’s use data on both the Tucson and Phoenix metro areas to exemplify buyer activity, since they represent the 2 largest population centers in the state. Given the context that there was a homebuyer tax credit stimulus in 2010 which was not in place for 2011, the increases in buyer activity in 2011 are quite dramatic. So Demand is Up – What About the Supply Side, in other words Listings? The number of Active Listings is down, meaning there is less product on the market to sell to potential buyers. Comparing October 2011 to October 2010, Tucson listing inventory is down 28% and Phoenix is down 40%. One way to evaluate the “health” of the housing market is to look at “Months Of Inventory”, which takes into account both buyer demand and listing supply. In other words, it is how many months it would take to sell the current inventory of listings at the current sales rate. 5 to 6 Months of inventory is typically considered a “healthy” mix of supply and demand, below 5 is considered a seller’s market and above 6 a buyer’s market. So how do we stack up? In Tucson there is 5.6 Months of Inventory and in Phoenix 3.6. So technically we are in more of a balanced market, in Phoenix you may even argue a seller’s market, than one might guess. What is this Shadow Inventory? There are numerous ways to define shadow inventory, and different data sources define it differently. For illustration purposes we will use data from Core Logic and a report from Standard & Poor’s. 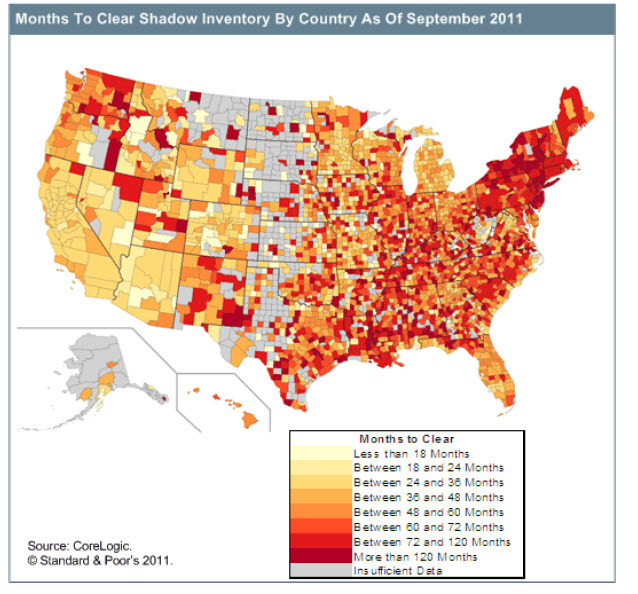 This chart represent the months to clear shadow inventory by county. What you can interpret from the map is that Arizona has one of the lowest supplies of Shadow Inventory in the nation. What does this mean? It means that in other states it will take a longer time than Arizona to work through the shadow inventory of potential distressed properties, and in Arizona we are closer to housing recovery. Shadow inventory includes all outstanding properties for which borrowers are 90 days or more delinquent on their mortgage payments, properties in foreclosure, and properties that are real estate owned (REO). Also included 70% of the loans that "cured" from being 90 days delinquent (loans that once again became current) within the past 12 months because cured loans are more likely to redefault. The calculation of the months to clear the shadow inventory is the ratio of the total volume of distressed loans to the six-month moving average of liquidations. Arizona has one of the lowest months supply of shadow inventory, meaning our rise from the housing crisis is happening faster than in other markets. It is a good time to explore your real estate options. To learn more about your local housing market in Arizona get a copy of The Housing Report, and to search for properties visit www.longrealty.com or contact your favorite Long Realty sales associate. Share the post "What’s Up With the Arizona Housing Market?" This entry was posted in Housing Market, Uncategorized and tagged arizona, Housing Market, housing report, Phoenix, Real Estate, tucson. Bookmark the permalink.